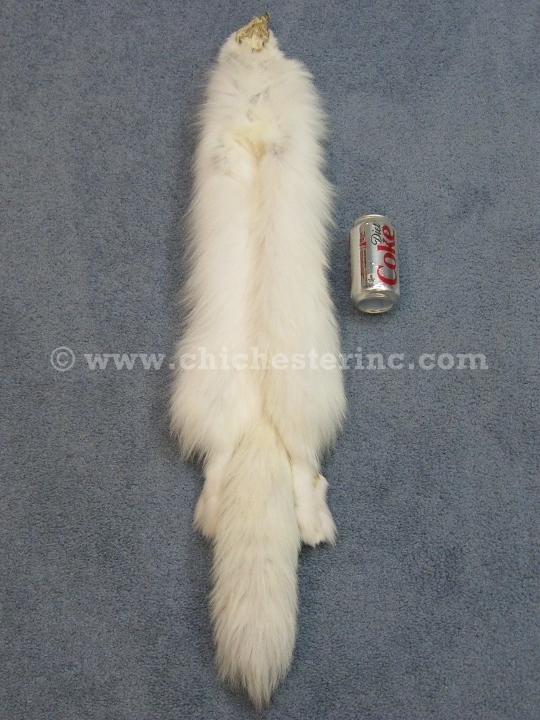 See size comparisons of the Arctic Fox skin with Feet, the Trading Post skin, and the Taxidermy-Quality skin with a soda can or square mat. Left to Right: Arctic Fox with Feet, Trading Post skin, and Taxidermy-Quality skin. 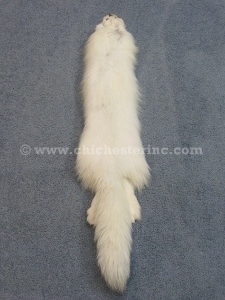 We usually have some arctic fox skins on hand, and they are available in several grades. We stock what we call a good, trading post quality fox. These have a good head, good body, and good tail but may be missing the front and/or back legs. They may or may not be cased skins. 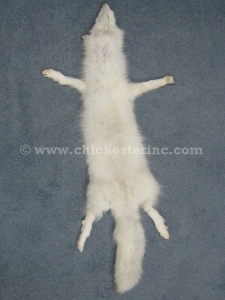 One Arctic fox skin we measured was approximately 29" (73.5 cm) from the tip of the nose to the base of the tail. We also carry some nice arctic fox skins with feet. They are similar to the trading post grade skins with the exception that they have all four feet still attached. 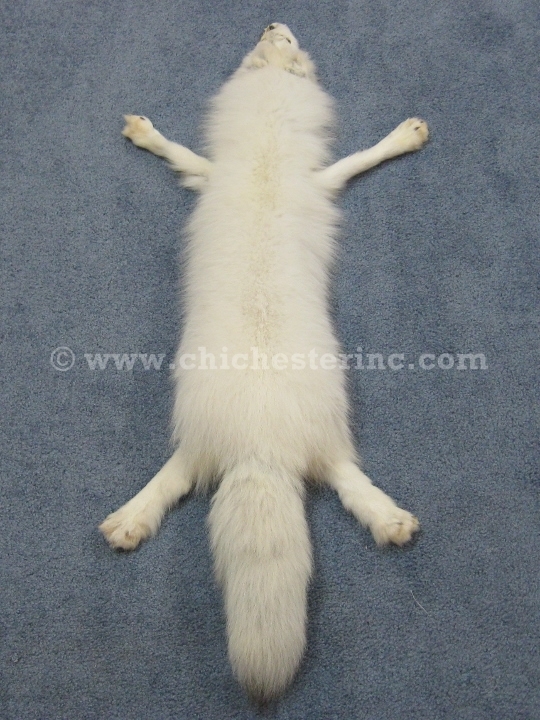 We also have limited numbers of taxidermy-quality fox skins that are suitable for life-size mounts. These are very rare and hard to come by. Each taxidermy-quality skin will be a gallery item so you can pick the exact skin you will be getting. We measured one skin as 30" long and 6" wide, with a tail length of 13" and weighing 0.54 lbs. The select grade skins were tanned at one of the best tanneries in the United States. They were purchased at a fur auction in Canada in 2017. Of 500 or 600 skins offered for sale, these were from the best lots in terms of quality, color, and clarity. Our Gxx codes denote individual pieces. 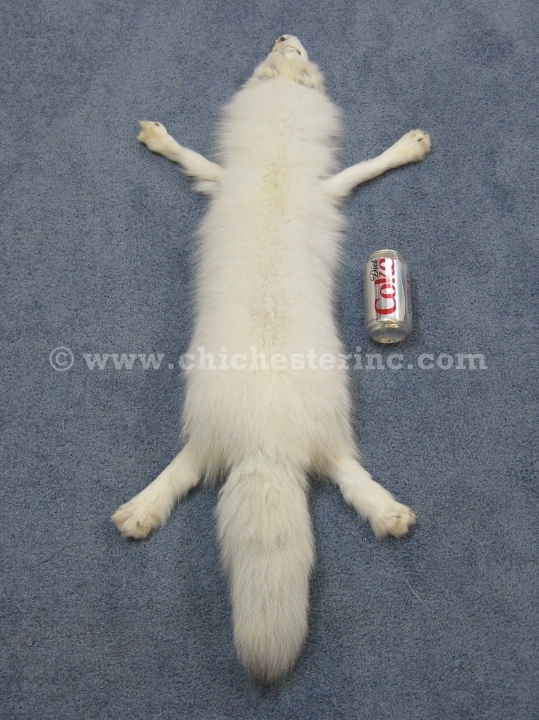 If you would like to order a specific arctic fox skin, please go to our Gallery to pick the exact one shown.